A perfect balance of tomato with the spices of Moroccan sauce helps add flavour, yet keeps the dish mild to suit the palates of aged care residents. Combine lamb, onions and carrot together and form into 50g meatballs. Place on an oven tray and cook at 180C for 5 minutes or until browned. Heat oil in a large sauce pan and lightly cook the capsicum. Combine KNORR Pronto Napoli and KNORR Moroccan Sauce GF, pour over the meatballs and continue to cook covered in the oven for an additional 30 minutes at 160 degree Celsius. Bring water to the boil. Add butter and polenta, cook for 2 minutes. Remove from heat, add KNORR Instant Mashed Potato Mix and parmesan. Serve with sliced brown bread, butter and a vegetable salad. 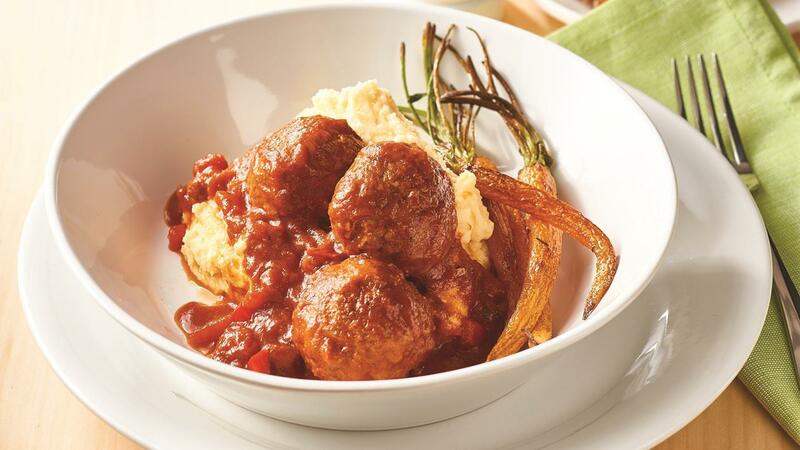 Tip – Turn meatballs into rissoles or savoury mince as an option.